3 bedrooms, with 3 fabulous en suite shower rooms...feel the 5 star hotel quality! 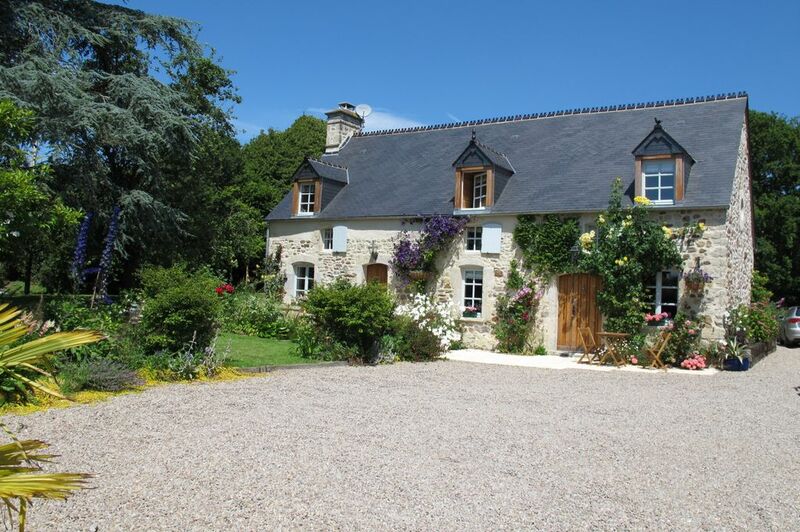 Delightful gardens, wood burner and great place to discover Normandy from. A solid oak front door opens into a large open plan room with a rare example of a perfectly preserved ancient Norman inglenook fireplace as centre piece. Complete with fireside snug, farmhouse style dining table and chairs and a fully equipped thoroughly modern kitchen cleverly harmonized with the original architectural elements of the building, this room truly feels like the heart of the home. The second ground floor room provides a flexible space depending on your group requirements, and can be configured as a double or twin en-suite bedroom with a very high quality zip together bed base and mattresses. The room has a charming rustic atmosphere, with exposed stonework and timbers. A wooden staircase from the main living area takes you to a small galleried landing leading to two further bedrooms. Chocolate box looking cottages that look as on a movie setting, yet renovated & modernized a 1 bedroom version for couples only in one and next door with 3 bedrooms and 3 en suite bathrooms.. an ideal all year round rural holiday location for couples, groups of friends, or families in well appointed and flexible accommodation. The interior decoration has been carried out with love and a touch of theatre by the owner Mr Daniel Parker, a BAFTA award winning and oscar nominated make-up artist for the film industry. The result are two delightful cottages full of personality and wonderful attention to detail. The cottages are surrounded by a large orchard garden to the west, with stone terraces directly accessible from the north and south sides of the house respectively. Renovated to a high standard in 2014, La Gloire is an exquisitely finished 1 bedroom luxury hideaway for couples. Outside is a sun terrace with rose garden, then on the ground floor is a living dining area with fully equipped kitchen (dishwasher, hob & microwave oven). There is a living area with TV/DVD and also a downstairs wet room finished in beautiful imported mexican stone tiles. Upstairs is a super king size bed (180cm x 190cm) with high quality box-sprung mattresses for a good night's sleep. The zip-lock beds can also be separated into 2 twin beds if preferred. French doors lead onto a private balcony with comfortable outdoor furniture, with views over the French countryside. The cottage benefits from satellite wi-fi access and has thermostatic heaters throughout, along with good quality insulation and windows for all year round letting. The “Blue room “ is the largest upstairs room with a double bed and luxurious en suite shower room. The “Green Room” has a double bed and luxurious en suite shower room. The peaceful atmosphere of the bedrooms is accentuated by high ceilings with exposed beams, a combination of stone with farrow & ball painted walls, the play of light from large south facing dormer windows, with views towards ornamental cherry trees and a traditional apple orchard in the distance. Outside there is a sun terrace with table and chairs, and to the rear and side there is a well-maintained flower garden and lawn area with picnic table and BBQ area. The cottage is equipped with Wi-Fi and has thermostatic heaters throughout, along with good quality insulation and windows for all year round letting. There is plenty of parking space outside for both cottages and a shared laundry facility in a separate outbuilding. I fell in love with the area whilst working on the HBO Band of Brothers series in 2002, part of which describes the D-day landings on nearby Utah beach and the subsequent battle for the peninsular which is now my home. The peacefulness of the countryside and the emptiness of the local beaches combined with a way of life that has changed little over the last few hundred years makes it ideal retreat from the hustle and bustle of everyday life. Because I work in film production, my work schedule can be quite hectic and unpredictable, and it is usually with a huge sigh of relief that I return to my peaceful haven to unwind! I hope you will enjoy the farm and the surroundings as much as I do, & whilst I live on site, rest assured your gites have their own private spaces. The potential of the property and grounds was too good an opportunity to pass up, it has taken a long time, but it was worth it, I hope you enjoy the place as much as I do! The property is tucked away in a tiny hamlet of its own, extremely private and off the beaten track, although close to the local network of cycleways and a short drive to local shops/bakery and restaurants. A beautiful cottage in a lovely location! The cottage is well decorated and it was so nice that each room had an en suite! Normandy is such a lovely region with so much to do and see. The cottage is well located for many sights including Le Mont Saint-Michel and the D Day landing beaches. There are two good restaurants a short drive away. Out only regret about booking this cottage, is that we didn't book it for longer! We hope to return! L'endroit est calme et bien tenu (intérieur et extérieur). Le cottage que nous avons occupé est correctement équipé et peut recevoir 3 couples, chaque chambre ayant une salle de bain. M. Parker, était présent et très attentionné. Beaucoup d'étrangers réservent ce cottage (UK, Allemagne, Hollande), et toutes les consignes sont en anglais, ce qui peut déconcerter certains de nos compatriotes. Nous avons beaucoup aimé notre séjour, et profité du beau temps pour visiter Valognes, Cherbourg, le Cap de la Hague, les plages du débarquement, Réville et Barfleur, Saint Vaast la Hougue...de belles découvertes, de bonnes tables et des ballades agréables. Nous recommandons vivement cette destination. Perfectly positioned between the best beaches on the peninsular, these cottages has the best of both world's, beautiful Normandy countryside, fishing ports, Chateaux, along with the rich historic value that Normandy has on offer. Equidistant from the unspoilt east and west coastlines of the Cotentin peninsula, “La Gloire” cottage is ideally situated to explore this beautiful region. The property is situated between two lovely market towns, Valognes (known as the Versailles of the north on account of it's beautiful architecture) and Bricquebec, with it's ancient castle from the 100 years war, dominating the skyline. To the east the WWII landing beaches are within easy reach. To the west the chic resort of Carteret is a must for great restaurants, boutiques, with endless sandy beaches, wild dunes and cliffs either side. Port Racine, Europe's smallest fishing ports. St Vaast la Hougue with its Vauban fort is a UNESCO site...they are all here and all less than an hour from the front door! Then there is the conservation areas and UNESCO sites locally - for example Head Office of Park Naturel Cotentin & Bessin is just a short drive down the N13 where you will find Carentan the market town with 7 rivers converging, in the winter months the whole of the area sees the flooding of the marshlands with migratory birds and the big skies reflected in the water, in the summer lush meadows with world class trotting horses and Normandy cows peacefully grazing...it's great both times of the year!